消除差异协同作战 — 提升空地联合近距离空中支援效能 - 《空天力量》杂志 - 知远防务论坛 ----学术性|资料性|研讨性！ - Powered by Discuz! Rebecca Grant, "The Clash about CAS" [关于 CAS 的认知冲突], Air Force Magazine 86, no. 1 (January 2003): 56 ("Stretching the Definition"), http://www.afa.org/magazine/jan2003/0103cas.pdf. Arthur P. Brill Jr., "Close Air Support: More Improvement Is Needed" [近距离空中支援：需要更多改进], Sea Power, November 2003, 1, http://findarticles.com/p/articles/mi_qa3738/is_200311/ai_n 9311629/pg_1. Operation Iraqi Freedom-By the Numbers [“伊拉克自由”行动 — 数据见证], (Shaw AFB, SC: Assessment and Analysis Division, US Central Command Air Forces, 30 April 2003), 5, http://www.au.af .mil/au/awc/awcgate/af/oifcentaf.pdf. Joint Publication (JP) 3-09.3 Joint Tactics, Techniques, and Procedures for Close Air Support (CAS) [联合作战准则 JP 3-09.3《近距离空中支援(CAS) 的联合战术、战技和程序》], 3 September 2003 (incorporating change 1, 2 September 2005), I-6, http://www.dtic.mil/doctrine/jel/new_pubs/jp3_09 _3ch1.pdf. Robert L. Sherrod, History of Marine Corps Aviation in World War II [海军陆战队航空兵在二战中的历史], (Washington, DC: Combat Forces Press, 1952), 25. Douglas N. Campbell, The Warthog and the Close Air Support Debate [“疣猪”攻击机和近距离空中支援争议], (Annapolis, MD: Naval Institute Press, 2003), 39. 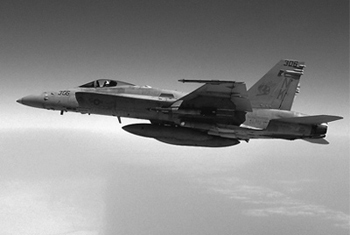 The United States Air Force: Basic Documents on Roles and Missions [美国空军：职责与使命基本文件], comp. and ed. Richard I. Wolf (Washington, DC: Office of Air Force History, 1987), 379. 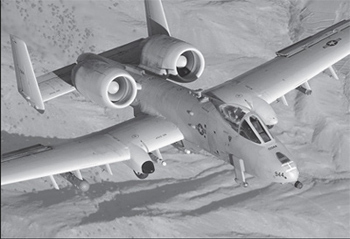 Benjamin F. Cooling, ed., Case Studies in the Development of Close Air Support [发展近距离空中支援专题研究], (Washington, DC: Office of Air Force History, 1990), 455. 关于上述用语，参看 Maj Rhett B. Lawing, "American Armed Forces' Service Culture Impact on Close Air Support" [美国武装部队不同军种文化对近距离空中支援的影响], Chronicles Online Journal, 18 December 2006, http://www.airpower.maxwell.af.mil/airchronicles/ cc/lawing.html. Sherrod, History of Marine Corps Aviation [海军陆战队航空兵在二战中的历史], 32. 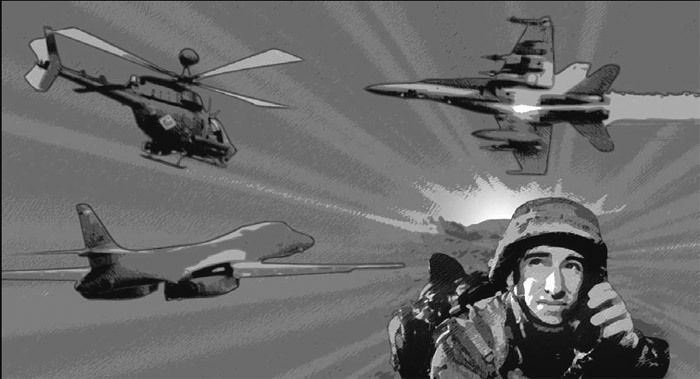 J. Kristopher Keener, The Helicopter Innovation in United States Army Aviation [美国陆军航空兵的直升机创新运用], (Cambridge, MA: Massachusetts Institute of Technology Security Studies Program, 2001), 13, http://web.mit.edu/SSP/Publications/working _papers/wp_01-1.pdf. United States Air Force: Basic Documents [美国空军：职责与使命基本文件], 403. Field Manual (FM) 3-04.111, Aviation Brigades [野战手册 FM 3-04.111《航空旅》], August 2003, Q-15, http://www.globalsecurity.org /military/library/policy/army/fm/3-04-111/fm3-04-111.pdf. JP 3-09.3, Joint Tactics, Techniques, and Procedures for Close Air Support (CAS) [JP 3-09.3《近距离空中支援 (CAS) 的联合战术、战技和程序》], I-1. FM 3-04.111, Aviation Brigades [FM 3-04.111《航空旅》], Q-16. 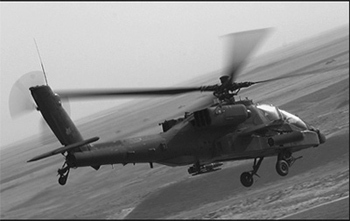 Maj Michael D. Grice, "AH-64 Apache Attack Helicopters: Integrating the AH-64 into the MAGTF Battle&not;space" [AH-64“阿帕奇”攻击直升机：把 AH-64 纳入 MAGTF 战空], Marine Corps Gazette 91, no. 3 (March 2007): 27-30. Lawing, "American Armed Forces' Service Culture" [美国武装部队不同军种文化对近距离空中支援的影响], 3. Air Force Doctrine Document (AFDD) 2-1.3, Counterland Operations [空军作战准则 AFDD 2-1.3《制陆权作战》], 11 September 2006, 34, http://www.fas.org/irp/doddir/usaf/afdd2-1-3.pdf. JP 3-09.3, Joint Tactics, Techniques, and Procedures for Close Air Support (CAS) [JP 3-09.3《近距离空中支援 (CAS) 的联合战术、战技和程序》], III-22. Deptula and Dahl, "Transforming Joint Air-Ground Operations" [转变联合空地作战，控制 21 世界战场空间], 4. Lt Col Eric E. Theisen, Ground-Aided Precision Strike: Heavy Bomber Activity in Operation Enduring Freedom [地面支持的精确打击：“持久自由”行动中的重型轰炸机], Maxwell Paper no. 31 (Maxwell AFB, AL: Air University Press, 2003), 1. 美国国会武装部队委员会全员战力与战备小组向少数成员的报告：战备训练延误及设备问题阻碍空中对地面部队的支持。(Washington, DC: General Accounting Office, 2003), 2. "Joint National Training Capability (JNTC)" [联合国家训练能力 (JNTC)], United States Joint Forces Command (Norfolk, VA: USJFC, 2003), http://www.jfcom.mil/about/fact_jntc.htm. Michael D. Millen, "Improving Detailed Integration in Close Air Support Planning and Execution" [改进近距离空中支援规划和执行中的详细整合], (thesis, US Army Command and General Staff College, 2004), 50. Reed, "Army's Transformation Impact" [陆军转型对近距离空中支援终端攻击控制的影响], 1. Bruce Pirnie et al., Beyond Close Air Support: Forging a New Air-Ground Partnership [超越近距离空中支援：塑造新型空地伙伴关系], (Santa Monica, CA: RAND, 2005), 72, http://www.rand.org/pubs/monographs/2005/ RAND_MG301.pdf. 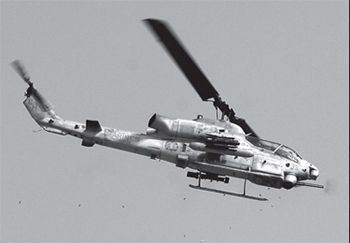 美军海军陆战队关于训练和战备的手册规定了执行 CAS 任务的 AH-1W 和 UH-1N 飞行员必须完成的理论科目和飞行训练要求，参看：http://www .tecom.usmc.mil/atb/Training%20and%Readiness.htm. "Fort Rucker, Alabama: Command and Directorates" [拉克堡：司令部及各作业处], http://www.united-publishers.com/rucker/command .html#des.